Banking doesn�t have to be a guessing game. It is interesting to play in the banks and one-pocket divisions at Derby City because you can really see the difference between the players who specialize in banks and the players who are great players but who don�t play the game of bank pool. On the first day of the tournament, the non-specialty players are all using some system. But by the second or third day, the systems go out the window. After that, everyone is playing by feel, which goes to show you that, as is the case with most other repetitive shots, once your muscle memory kicks in you just know how and where to hit the ball. Obviously, banking is important in rotation games as well, so I practice bank shots a fair amount. I use points in the room to line up where to hit shots. 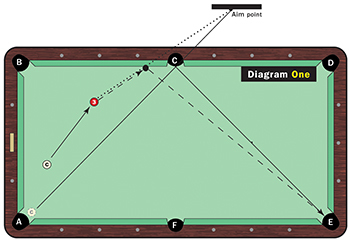 For example, if I�m going to bank the 3 ball into pocket E (Diagram One), I look at the natural angle from pocket A to pocket E. The midway point is through pocket C. So I follow that angle to a point on the wall (thick black rule). That�s my mark if I want to bank any ball into pocket E. It�s the mirror image. As long as I�m banking to that side of the table, that is my point. It�s something I see very quickly. And then you can just run your cue parallel to that line for other banks. The mirror system is an easy system for players to learn at the start. Obviously, in a big tournament venue like Derby City, you don�t find those points as easily, so I try to practice a lot at home before this tournament so that I�m already pretty comfortable when I get here. As for speed, Nick Varner always says there are only two ways to hit a bank � slow speed or firm speed. Once that sank in, my banking really improved. Two years in a row I finished in the top 10. Before that, I had no chance. When you watch a player who doesn�t bank well, he is usually playing each shot with different speeds and spinning the cue ball. When you watch great bankers like Shannon Daulton or John Brumback or Billy Thorpe, it�s almost always a firm speed and no English. Or, just the opposite is someone like Ike Runnels, who hits all his shots at pocket speed. The key is that they all stick to one thing. It helps develop consistency and a better feel. If you�re switching all the time, it�s a lot harder to gain any consistency. The same system holds true for three-rail banks (Diagram Two). Again, I know that if the cue ball was at pocket A and I wanted to bank it to pocket B, the line runs through pocket C. Now, I know from systems that I would need to shoot the cue ball a half diamond to the right of pocket C to hit the first diamond on the top rail near pocket E. And from that angle the cue ball would travel toward pocket B. I know it�s going to be close to the pocket. At that point it�s more about the speed. After a few tries, you�ll know the proper angle.